Okay, so it’s time for another check-in. We need to do this every so often, just to be sure that my various thought streams are staying congruent with the big picture. Too easily, analysis can chase down the pieces and forget that all these finer distinctions are elements and features of a greater whole. We become widget specialists and lose our appreciation (if we ever had it) of how all of it seamlessly fits and flows together. I’ll take you on a tour through the diagram above, first moving vertically up the center axis and then left-to-right. 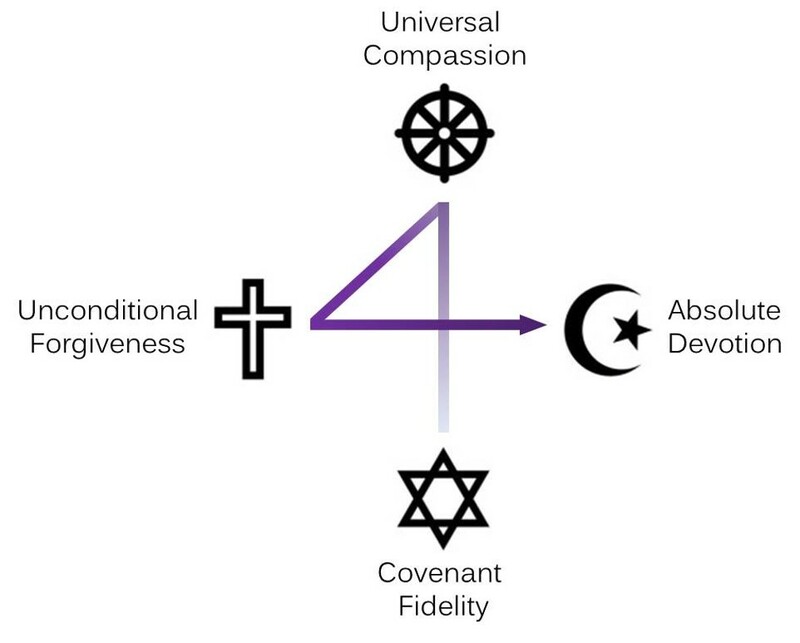 If you’ve been keeping up with my posts, the symbols and terms should be familiar, though I’ll do my best to give concise summaries where I can. 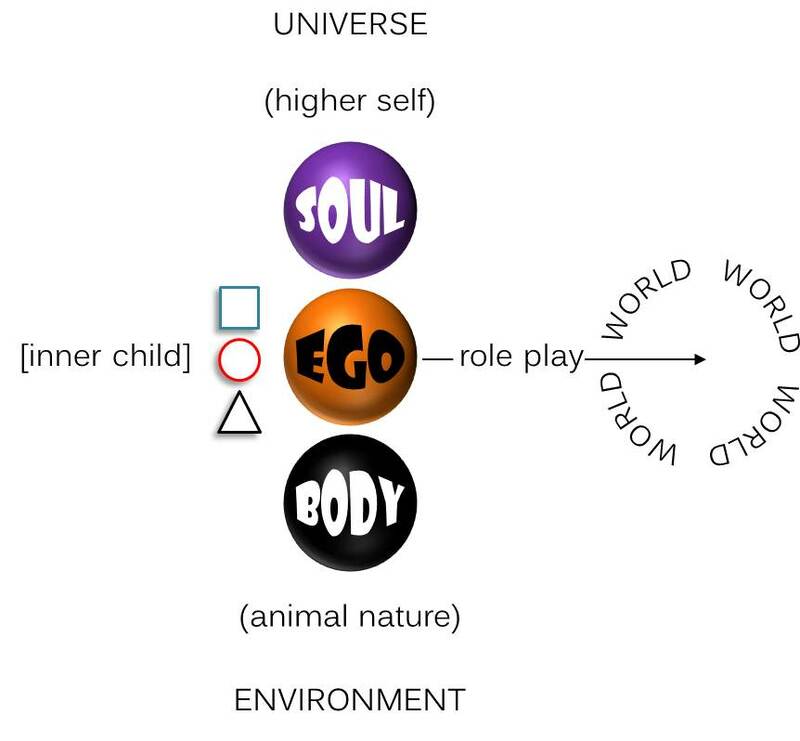 Arranged along the center axis are three mental locations where human consciousness engages reality: in the body (sensory-physical realm), the ego (socio-moral realm), and the soul (mystical-intuitive realm). Notice the correlations along each side of the three mental locations, the way consciousness turns inward on the left side and outward on the right. “Inward” and “outward” take on very different connotations, however, depending on the location being considered. Internal, subjective, and existential (left side), or external, objective, and transcendent (right side) are not synonyms but fundamentally distinct orientations of consciousness. This isn’t really a controversial idea. Just take a moment to notice how the physical environment around you now is accessible to your physical senses, but how the assigned values and meanings that incorporate parts of the environment into your personal world are not. Stepping up one more level to the mental location of soul, you should be able to appreciate the extent in which the transcendent unity of existence is not something you can detect with your senses, and neither is it a mere construct of meaning contained within the horizons of your personal world. Again, notice how the physical organs and urgencies in your body stand in a distinct dimension from the beliefs and prejudices carried in your ego. And then contemplate the ground of your existence as it opens within you and rises in the quiet presence of being-itself. There are no organs or beliefs inside the soul, only an expansive clearing of present awareness and inner peace. Your existential ground and the transcendent unity of existence are not somewhere inside or outside of you, but instead are the mystical-intuitive dimension of reality as accessed through the mental location of soul. Then why are we accustomed to speaking of body and soul as “mine,” and as separable from each other? Why do I live “in a body” and “have a soul”? Come to think of it, who is this “I” that presumes ownership of a body and identification with a soul? 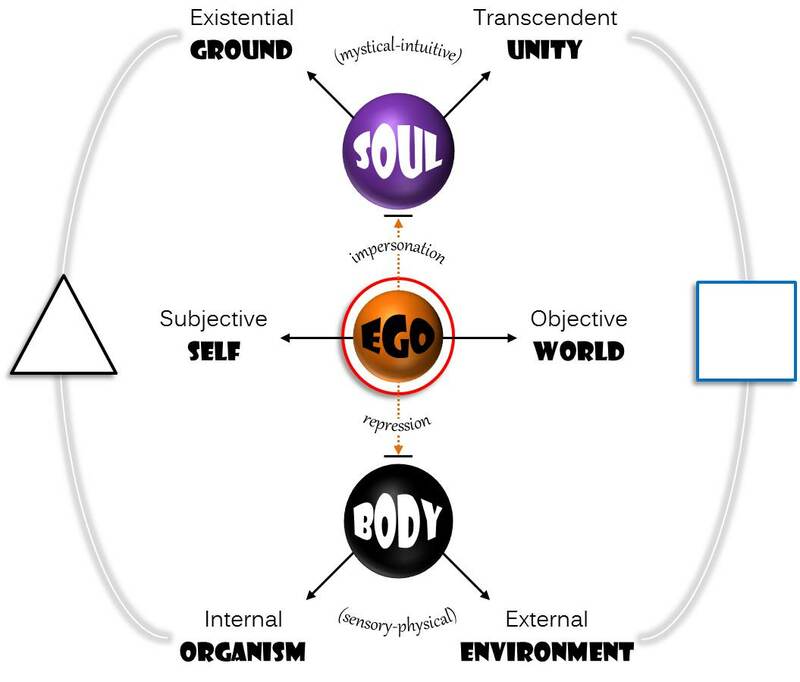 The answer brings us to the center of my diagram, to that mental location of consciousness known as ego. While body and soul are considered primary to what you are as a human being, your identity is something that was (and still is) constructed in the interpersonal context of society. It’s helpful to distinguish between essence (what you are in your being) and identity (who you are in the world). Whereas essence (body/soul) is what makes you human, identity (ego) is how you define yourself as a person. This notion of ego as a social construct wonderfully complicates the human adventure, since every individual ego is a product to some extent of the society that shapes it. I’ll just give a summary account of the process as it relates to the left-to-right horizontal axis of my diagram. Your identity – and I’m referring not just to the roles you play in the world, but to yourself as a performer of roles – got started in the awareness that your tribe expected certain things of you. Earliest on, these expectations were focused around the need to take control of bodily impulses, and not merely to gratify them spontaneously whenever the urge arose. The morality of your tribe at this stage was simple and binary: Do this, and Don’t do that. Your options were clear between good and bad, right and wrong, yes and no. The challenge of membership was not settled by the mere fact of your birth or adoption into a family. To be “one of us” and a good boy or girl, some mechanism of restraint was imposed on the urgencies of the body, and in the pause or delay opened up by that restraint, a quantum of consciousness was harnessed and steadily shaped into Captain Ego. Since you were dependent on your provident taller powers for protection, nourishment, and support, this discipline of repression – literally pressing those spontaneous impulses back into the body (or what is also called “holding it”) – eventually produced the illusion of an ego as separate from the body, as well as from the rest of reality. Though the uterine conditions of your mother’s womb may have been optimal, the situation changed dramatically once you were delivered (or expelled, depending on the myth) into the social womb of a family. There, whatever distress your nervous system took along with it was either mitigated or magnified by the relative health and attentiveness of your family system. Security, then, is the sense that reality is supportive, provident, and sufficient to your needs. It has both an animal aspect, in the relative composure of your nervous system, as well as a spiritual aspect, to the degree that you are able to rest in the grounding mystery of existence. And wouldn’t you know it, but nobody gets through this gauntlet without some insecurity – not even you. This brings us back to the center of my diagram, to the circle that surrounds ego, a shape representing attachment. This is how you compensated for whatever lack of security you may have felt: you reached out and latched on to whatever could help calm you down. Not surprisingly, the greater your insecurity, the more desperately you gripped down and held on. Along with this behavioral holding-on came emotional identification with the objects of your attachment, as well as increasingly unrealistic expectations (and expressed demands) that your objects never let you down. Perhaps it was a combination of this imperial claim on reality along with a vigorous dis-identification with the body, that first inspired ego to impersonate the soul and insist on its own immortality. We should note that it likely wasn’t some keen insight into the evergreen nature of soul but a consequence of its own opposition to the mortal body, that motivated ego to regard personal identity as something that must live forever. Personal immortality is quite a late development in religion, but once it took hold as a doctrine, religion (in particular, theism) became increasingly preoccupied with ego’s escape plan. But let’s stay in the world a bit longer as we move one more step to the right in my diagram, to a square which represents the ego’s need for meaning. Actually “world” and “meaning” are deeply synonymous, since your world is a personal system of meaning that you are busy constructing and maintaining in cooperation with your tribe. I have placed the square, with its four sides for boxing up reality, on an arc stretching between body’s external environment and soul’s transcendent unity of existence. This makes the point that your world is neither a simple arrangement of empirical facts, nor an infinite horizon containing all of reality. It is a very selective, biased, and egocentric work-in-progress. A primary function of your world is to justify and protect the attachments which in turn pacify your deeper insecurity. Ego’s subjective self and objective world are thus the inside and outside of “me.” But in truth both are constructions, two sides to a complicated role play, a lifelong project of make-believe. I’m using the word “truth” here as a reference to the way things really are, to the reality beneath and beyond the illusion of meaning, which may shine through or break apart your tidy system in moments of epiphany or apocalypse. That famous line from the film A Few Good Men (1992) – “You can’t handle the truth!” – applies to most of us, most of the time. So what’s the upshot of all this? Why hold up the mirror this way and a take an honest look at yourself? Very simply – and this is the ultimate aim of what is called “awakening” – to help you realize what you’re up to. As the morning sun fills your curtains, perhaps this will be the first day of the rest of your life. Soon after you were born your family got to work, training you into a well-behaved member of the tribe (a “good boy” or “good girl”). Although you were already related to others in the circle by genes or adoption, the process of turning you into “one of us” involved the force of culture, as distinct from that of nature. A human society is more than a collective for mate-pairing, reproduction, protecting the young, and sharing resources. Again, at the cultural level it is also a system of morality and ideology – an orthodoxy that shapes the consciousness of its members into a common agreement concerning the meaning of life. You weren’t born with a preconception of life’s meaning. What something means is a matter of making numerous associations within a coherent reference system, between that thing and other things, from that thing to antecedent causes, symptomatic effects, and prospective ends or outcomes. The meaning of something is about linking it into a web of proximal and distant, similar and different, identical and opposite, previous and subsequent other things. Putting this mental picture together takes time and experience, as well as some pretty serious construction work. Your tribe didn’t leave you alone on the job. It provided you with the materials and tools that meaning-making requires, as well as the blueprints and inspection codes you were expected to follow. All of this mind-shaping, meaning-making, and world-building activity of culture conspires to put its members into a TRANCE, which has at its core that common agreement concerning the meaning of life mentioned earlier. By definition, a trance is a “passage” or transitional phase to somewhere else. A hypnotist puts his subject into a trance so that he or she will unquestioningly obey the hypnotist’s suggestions. The collective culture puts its members under a similar spell, for the purpose of seducing them with the suggestion that they are separate individuals and incomplete without what the tribe has to offer. As you slowly slipped under, the dream of your separate existence – variously judged as special, flawed, ignorant, unworthy, or depraved – started to take on the feel of reality. You really were all those things! As you looked out the window from your solitary confinement, you saw other egos obeying the same commands, which only confirmed and validated what you felt. The moment you gave your full agreement to the orthodoxy of egoism you fell completely into the DREAM. 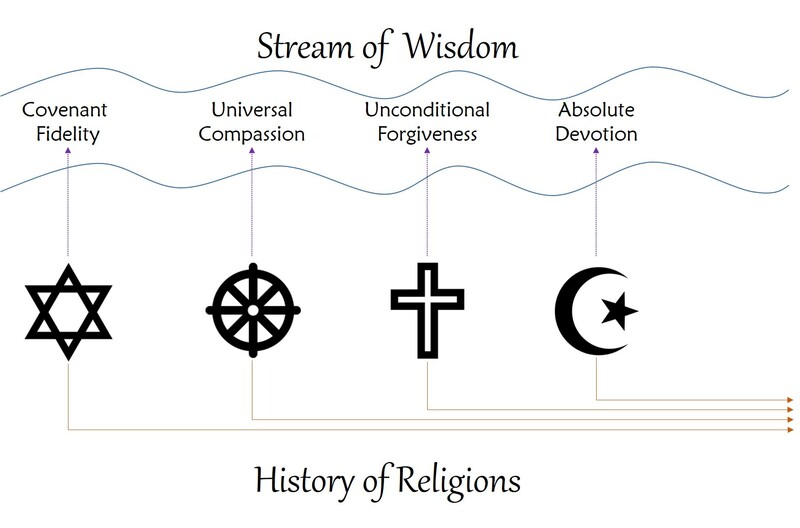 Across the wisdom traditions of the world, the word “awakening” is widely used in reference to the event (or process) that leads to liberation. This term also carries a diagnosis regarding the human condition, which is that you are caught in the dream state of ordinary consciousness – and you don’t even know it. As you look around it all seems very real, when you are really just looking at a dreamscape of your own making. Let’s spend a little more time with this concept, as it is easily (and often) misunderstood. We are not saying necessarily that what we see around us is only an illusion – not actually there, but only appearing real. Leafy trees, clouds overhead, other people walking about: these are real facts in the external environment, even if their appearance, orientation, and proximity to you are an obvious function of perspective and depend on your relative position as an observer. These same objects take on an illusory effect when we add your appraisals of them as good or bad, pretty or plain, useful or worthless, yours or mine – all labels rather than actual properties, opinions and not facts, projections of yours onto reality and not at all real. Such judgments concerning the value and meaning of things are part of the fantasy you believe. They are ego extensions; and just as your sense of being a separate self is a construct of cultural orthodoxy, everything that carries this doctrine of separation into your general outlook on reality serves to promote the dream and keep you asleep. So all those labels, judgments, and opinions are projected onto the reality of things. During childhood you were steadily lured into a trance, taught to believe that you are separate and special, that everything else stands in some relation of value and meaning to you. As this whole process was a slow seduction, you gave your agreement without really knowing what was going on. At times even now you may catch a glimpse through the veil hanging over your mind and be momentarily startled by the realization that your worldview is a cultural incantation – a tribal convention, a mental construct, a fantasy of meaning. But pretty soon the sleepy smoke dulls your focus, the trance takes over, and you are comfortably back in the dream. The thing is, this dream isn’t all candy canes and rainbows. Inevitably, as in the movie The Truman Show (1998) where the bowsprit of a runaway sailboat carrying Truman (Jim Carrey) tears into the fabricated sky at the edge of the world he believed was real, the social conventions that keep the veil of meaning in place slip out of position or fall into tatters. It might be the sudden death of a loved one, the collapse of a career, the breakup of a friendship, or what I like to call “consumer fatigue”: the progressive exhaustion of hope in chasing fulfillment through something outside yourself. The Western – specifically North American – ego is powerfully conditioned to regard itself as empty inside, entitled and demanding, and in need of being filled up. Of course there’s no filling-up to any kind of lasting satisfaction, for the simple reason that the consumer ego is a fast open drain. By whatever means the disturbance comes, the deeper fall from dream into NIGHTMARE can be devastating. Value and meaning have collapsed or leaked away, leaving you disoriented and grief-stricken. For some people this might be the end; seeing no reason to go on, they take their own lives. A few will survive the nightmare and slowly repair their damaged dreamscape, adjusting back into an egocentric existence, though tempered perhaps by a sharp edge of cynicism. And there are those who will endeavor to spread their nightmare onto others, becoming apocalyptic alarmists, militant crusaders, violent terrorists, or convicted fanatics. If you happen to find yourself in a nightmare, you may be closer to AWAKENING than ever before. As I’m using the term, awakening is not a destination but a process; in this way we might think of it as the reversal of a trance. Just as trance is a passage into the dream state, awakening is the path of disillusionment that leads out. Awakening is ongoing. It can come dramatically or by increments, but the process never ends. Enlightenment can make it sound as if an end has been reached, but once any attempt is made to construct meaning around it, what we have is another illusion and not the persistent commitment to clear-sighted awareness that awakening signifies. Nightmares are conducive to awakening because the work of disillusionment – the stripping away of illusion – has begun against your will, without your consent, and despite your best efforts at keeping the dream intact. The dream itself has built-in safeguards against awakening, with its 24/7 propaganda machine and seductive promises. In a nightmare, however, the gravity of your loss and the distress of your situation veritably scream a call for change. Sometimes pain can be your most effective teacher, and grief your most precious companion. Upon awakening you can see things as they really are – without labels, without judgment, and completely free of meaning. You realize that reality is one, everything is interconnected, and nothing (listen up, ego) is separate from the whole. You can relax into being, observe without opinions, and love without fear. It’s not really about you. Once upon a time you fell out of union with maternal providence and exited to a realm of bright light, sharp noises, cold air, and hard surfaces. In an instant your animal instincts were activated in the business of keeping you alive. If all had been well in the womb, then in all likelihood this new blooming, buzzing environment soon resolved into the soft warm skin and cooing face of your mother. Her (or your caretaker’s) attentive presence quickly calmed your nervous system and helped you feel assured that reality was sufficient to your needs. This assurance, imperfect as it is and without guarantees, is known as security. 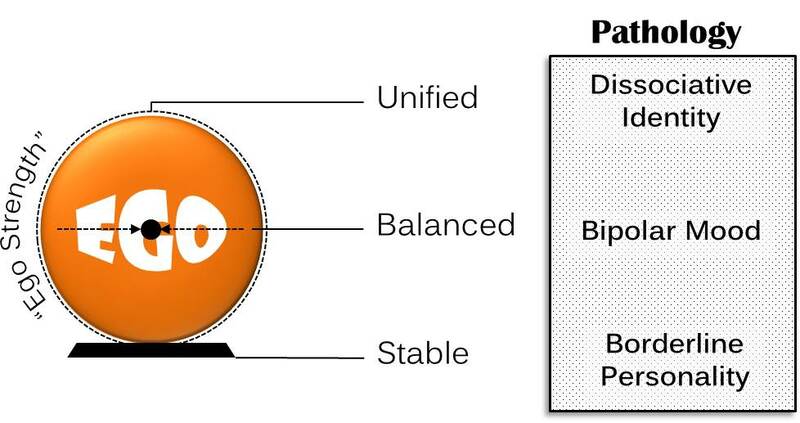 I symbolize it in my diagram above with a triangle, stable with a wide base and balancing everything else on its tip, suggesting that under conditions of insecurity the higher system might not hold together so well. When the nervous system registers a hostile reality instead of a provident one, the resulting pathology can be a borderline personality chronically at risk of falling through the floor and into the body’s urgency. Your adequate care outside the womb provided an attachment bond which partly pacified your lingering insecurity, as well as served to shape your brain for life in relationships. Research confirms the vital significance of that primal bond, as a mother’s right (intuitive, emotional, and empathic) hemisphere entrains the infant’s brain into a coherent state. I have symbolized this need for attachment with a circle, with its suggestion of inclusion and belonging. If you imagine a vertical energy axis anchored in your gut where the environment is metabolized into the mass and energy of the body, then with attachment our focus has shifted upward to the heart-center. While we’re on those shape symbols, let’s complete the set by adding a square to represent your emerging need for meaning – to have a mental model that makes sense of reality as you experience it. We’ve moved now from the heart to the head. The frame of your square tends to be as large as your attachments allow, which is simply to say that stronger attachments have the effect of shrinking the scope of relevance only to what is urgent or useful in keeping the bond intact. As a constructivist I regard meaning as something human beings construct rather than “discover” in reality. You are always busy making meaning that protects your attachments and calms your insecurity. All of this goes into what I have called your Personality Code, referring to the preferred way you orient yourself in reality (gut/security, heart/attachment, or head/meaning) and the relative clarity of consciousness across the three centers. A high degree of clarity correlates with “ego strength,” where your personality is sufficiently stable, balanced, and unified to support experiences of ego-transcendence known as power, love, and truth. For more on the Personality Code, see http://wp.me/p2tkek-DE. Almost imperceptibly we started with your birth once upon a time and followed the path of early development into your personal identity as an ego. The steps along the way to a fully established sense of who you are – all the drama around your need for security, attachment, and meaning – shaped part of your personality that sits just beneath and behind Captain Ego, called your inner child. I’ve put the term in square brackets to make the point that your inner child, which was who you were during your actual childhood, is today kept inside and out of your adult affairs. However, still today as an adult whenever you get pinched, triggered, or poked emotionally, to the extent that you feel your security, attachments, and meaning threatened, something very “childish” comes out of you. You become reactive, impulsive, defensive, aggressive, manipulative, or sullen. The particular forms of expression this takes for you is what I have named your neurotic styles, which evolved as adaptive strategies for getting your way. For more on that, see http://wp.me/p3e1Rr-5Y. It’s important to see that your ego is not some thing, like a metaphysical entity living inside your body. It is simply the self-referencing center of executive control that inhabits the roles provided by your tribe (family, peer group, professional community, political party, nation, etc.). Not only is your ego an actor playing a variety of roles in the realm of relationships, it also serves the function of managing the numerous “sub-personalities” that live inside you. You know these sub-personalities as distinct trajectories of impulse, mood, and motivation that come out and drive your thoughts, feelings, and behavior. One of ego’s principal contributions is to provide some executive management over these various (and occasionally competing) aspects of your personality. For the most part your ego does a decent job managing this crew and steering through the role plays that comprise your daily life. Somehow through it all you want to keep your identity intact, feel secure, stay connected to the people who matter to you, and live a meaningful life. The system that makes this possible is called your world. In previous posts I have described this concept of a world on the analogy of a spider web. The spider (your ego) spins out a design of thread (your world) across The Void and proceeds to live inside it. Your world is your personal “spin” on things, the peculiar way by which you construct meaning, connect to others, and maintain your sanity. In my diagram you’ll notice that ego isn’t the crowning achievement or last word on what a human being is or can become. While experience at this level is very dramatic and seemingly all-important, ego and its world are really nothing more than a delusion of consciousness. The neurotic styles of your inner child, the role plays where so much of your attention is invested, and even that executive center of identity called “I, myself” (ego) are a kind of reaction-formation entirely conditioned by your upbringing, your socioeconomic location, your life circumstances, and the somebody you’re trying to be. It’s not only possible but highly likely that most people spend an entire lifetime (in the Orient, numerous lifetimes) striving to keep it together, hold on to what matters, and reach a better station at some point in the future. The spiritual life is ultimately about an awakening of consciousness beyond ego and its world. While this idea is too often conveyed in mythic-literal language as an out-of-body, end-of-life deliverance to a heavenly paradise, it is actually all about here and now. In fact, because the ego-world duality effectively cuts out a genuine present-moment awareness of existence, awakening from this trance (earlier I called it a delusion) brings you to the very ground of your being, where “I” dissolves away and All is One. This is what I name the present mystery of reality. Your higher self, then, not only refers to your taller adult self that is capable of taking a more rational and responsible perspective on things. It also names your creative authority for transcending (“going beyond”) me and mine (as well as beyond the tribal us and ours) in a larger, more inclusive, interconnected, and holistic understanding. It is in this spirit that the term “universe” is used to speak of all things turning as one. Rather than merely naming a scientific fact, this concept expresses a spiritual realization, which is to say, a realization reached by your spiritual intelligence (SQ) of the unity of being. In other words, as I’m using it here, “universe” is not simply what’s out there and all around us, but a sacred name for the breakthrough intuition that here and now is all there is. Let’s begin by arranging the following clusters of values in order of priority as you consider your personal preference. Is it more important in your opinion to know the truth, love and be loved, or have things under control? Most likely you value all of these, but which cluster is highest on your list? Obviously you shouldn’t choose the one you think I will admire most in you, or the one that those closest to you hope you will select. Just be honest. Whichever ends up third on your list isn’t necessarily of no value to you, but merely of lower value relative to the other clusters. Now, on the graphic to the left write the letter ‘S’ inside the square, or the letter ‘C’ inside the circle, or the letter ‘T’ inside the triangle, depending on your preferred cluster of values. Only insert the letter in the shape of your top choice, leaving the other shapes blank. Got it? How would you score yourself on a scale of 1 (low) to 3 (high) that measures how flexible your belief system is? Are you fiercely committed to what you believe, or are you constantly updating your knowledge and opinions as you go along? Would you consider your world – referring to the system of meaning that you have constructed around yourself – less or more reality-oriented? Do you test your beliefs on a regular basis to be sure they square with the way things really are, or would you regard yourself a person of strong convictions that you won’t let go of so easily? If your belief system is flexible and reality-oriented and you regularly test and update your perspective on things, then give yourself a 3 (high). If you don’t think these qualities describe you at all, give yourself a 1 (low). If you’re somewhere in the middle (somewhat flexible and open-minded but still pretty set in your views), then go with 2 (moderate). Write your number to the right of the ‘equal’ sign next to the square. Now, how would you score yourself on a scale of 1 (low) to 3 (high) that measures the strength of your relationships with others. Do you move quickly and easily into relationships – and just as easily out of them when partners become controlling and abusive? Is staying in a dysfunctional relationship preferable to being on your own? Would you agree with the statement that “love makes the world go round,” or have your efforts at love more often thrown you into a whirlpool of hurt and confusion? Do you seek out occasions and opportunities where you can meet people, make friends, and expand your network of social support? If you get along with others and don’t very often get caught in conflicts, then give yourself a 3 (high). If you frequently get crosswise with people and have an impossible time untangling your feelings, give yourself a 1 (low). If you’re somewhere in the middle (preferring company but hesitant over jumping in), then give yourself a 2 (moderate). Write your number to the right of the ‘equal’ sign next to the circle. Finally, how would you score yourself on a scale of 1 (low) to 3 (high) that measures how stable you are in yourself? Are you doubtful when it comes to your abilities and the support you need to succeed in life? Is it easy for you to give away your power and let others call the shots? Do you hide behind authority and work hard to shine glory on those in control, to such a degree that you have little light left of your own? Are you chronically anxious over the possibility of things not working out, or can you stay grounded come what may? If you are anchored in your being and in touch with your source of creative power, then give yourself a 3 (high). If on the other hand you lack confidence in yourself and reality in general, give yourself a 1 (low). If you’re somewhere in the middle (capable of trusting but preferring to play it safe), then go with 2 (moderate). Write your number to the right of the ‘equal’ sign next to the triangle. You should end up with a letter in one of the shapes and a number to the right of each shape. This is your Personality Code. You might be a C132 or a T213 or an S321, or something like that. The letter identifies your preferred locus of engagement with reality, at the level of your head (square), heart (circle), or gut (triangle); while the number sequence represents the relative clarity of consciousness across all three loci. The number range from 1 (low) to 3 (high) places you on a continuum of ego strength, where 1 is borderline, bipolar, and dissociative (not necessarily at clinical levels of pathology) and 3 is stable, balanced, and unified. As explained in previous posts, normal development will satisfy the individual’s need for security, attachment, and meaning, to the point where he or she is capable of (i.e., possesses sufficient ego strength for) transcending “me and mine” in the experience of self-actualization. The clarity and flow of consciousness in self-actualization is variously named power, love, or truth depending on the favored locus (gut, heart, or head respectively) of the individual. Your gut (particularly the digestive organs and glands) is where the raw materials of nutrition undergo conversion into the mass and energy of your body. For that reason it is the portal of consciousness into its own grounding mystery and the deep source of your creative power. This is also why, when your security is threatened or your power is momentarily lost, you feel upset in your gut. Your heart is where you make emotional connection to what’s around you, most importantly to those human others – family, friends, strangers, and enemies – who collectively shape your personal identity. It is the portal of consciousness into the realm of relationships, your center of empathy and love. For this reason, you might speak of a loss of love as heartbreak and experience it as pain or heaviness in your chest. And your head (mind) is where the mental construct of a world is made out of your assumptions, beliefs, thoughts, and intuitions of meaning. It is also the portal of consciousness into reality on the other side of meaning, which shines though (or burns away) the veil in moments of truth. However, if the veil is too opaque to let in the light of reality … or we might also say, if a naturally questing intelligence is locked inside inflexible and outdated convictions, this ignore-ance of what’s really real can cause mental fatigue and migraine headaches. The Personality Code is not intended to render a diagnosis and lay one more identity contract on you. But perhaps it can be useful in helping you see why you get poked and hung up the way you do sometimes. It might also suggest a way through the suffering to a more authentic and fulfilled life.